Toronto is a beautiful city to get away for a weekend babymoon. The iconic CN Tower literally towers over downtown Toronto’s sprawling skyscrapers. But Toronto isn’t all downtown cityscape – it has tons of beautiful green space, as well! Fairmont Royal York is the perfect place to call homebase during your babymoon adventure. Its central location means you’ll be near Toronto’s biggest attractions, like the aforementioned CN Tower, where you can head to the top for panoramic views of the city. Unwind with a massage in Fairmont’s Health Club, where Swedish massages start at $65 for 30 minutes of relaxing bliss. No trip to Toronto would be complete without exploring its harbourfront. The Harbourfront, on the shore of Lake Ontario, is perfect for a day spent strolling, browsing shops, stopping into cafes and checking out events. Toronto’s waterfront has something for everyone, including the Harbourfront Centre, a non-profit organization which a variety of exciting cultural events. Upcoming festivals include the International Festival of Authors and Swedish Christmas Fair. For a romantic and unforgettable dinner, reserve a table for two at the top of CN Tower’s 360 Restaurant. Seasonal menus rotate for the summer and winter seasons. A 3-course prix fixe menu is available for $79 with various options available for each course. Take some time to check out Toronto’s world-class museums and art galleries. The Art Gallery of Ontario, fondly referred to as AGO, is brimming with a variety of interesting art. Check out SuperReal, a fun, colourful exhibition featuring pop art from the museum’s collection. 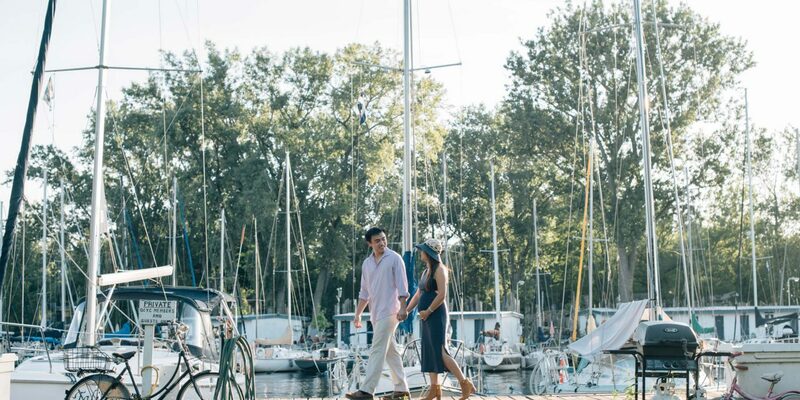 However you decide to spend your Toronto babymoon, be sure to check out our 5 favourite tips for planning the perfect babymoon (and check out another beautiful Toronto babymoon session).